Hello and welcome to our website. 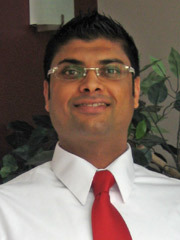 My name is Dr. Sony Sandhu and I am one of the two founding Chiropractors here in our Surrey clinic. I was born and raised in Fort St. James, BC where I played several types of sports growing up. I was first introduced to Chiropractic care when I injured my rotator cuff playing competitive baseball. Doctors told me that I should consider quitting due to the condition. My parents took me to a Chiropractor for treatment and over the course of a few weeks, I had completely recovered. I knew that I too wanted to help people in this way. After attending Simon Fraser University, I moved to Portland, Oregon in 2000 to begin my Chiropractic Education at University of Western States. I moved back to Canada in late 2003 when I started working at Newton Wellness Centre. I continue to stay very active in sports. I play ice hockey two to three times per week. I squeeze in tennis once a week and try to get into the gym two to three times per week. As a result, I have my spine manipulated weekly to minimize aches and pains. I look forward to providing you with best healthcare I possibly can. The most valuable people to any practice is their patients – without patients, the practice serves no purpose. Being an MOA graduate alongside years of customer service experience helps me in understanding our patients and their needs. As an Office Manager, it is my greatest objective and pleasure to ensure that your visit to our clinic is as efficient and comforting as possible. I am a social and outgoing individual who enjoys the interaction with our new and existing patients and assisting with any questions or concerns they may present. Implementing my knowledge, and skills to rid the discomfort and pain anyone faces is the most rewarding aspect of what I do. My goal is to have you feeling the best you. My targeted approach consists of myofascial release, lymphatic drainage, Swedish massage techniques, GTO relase, frictions, joing mobilizations and trigger point therapy. Living an active lifestyle, I have constantly been aware of my body’s needs. Having the natural interest to challenge myself to make choices that are in the best interest for a healthy way of life, I found myself following a path that embarks in sharing my passion with others. After completing my degree in Kinesiology, I focused my direction towards massage therapy and have since obtained my certification at Vancouver College of Massage Therapy. I take an individual approach to address your specific needs. Not only is it my job, but more importantly, it’s my passion. Pinder Dhillon graduated from the Massage Therapy program at the West Coast College of Massage Therapy in 2016. He has always been interested in human anatomy, health and wellness which lead him to pursue a career in massage therapy. Pinder enjoys working with a wide variety of conditions and people of all ages. He is grateful that his career allows him the opportunity to continually learn and develop as a health care practitioner. Treatment modalities Pinder uses include Swedish Massage, active &passive stretching techniques, trigger point release, GTO, positional release, range of motion, fascial release techniques, joint mobilization, remedial exercises and most importantly patient education. Pinder encourages his patients by teaching them the tools of proper stretching/strengthening and reinforcing postural awareness. If you think that you or a loved one is a good candidate for chiropractic care, contact Newton Wellness Centre to arrange a thorough examination in our practice.